“Nobody cares about making movies about people anymore. All they care about is special effects,” a character says early on in F/X (1986), an exciting thriller that blurs the line between illusion and reality and turns 25 years old today. With the rise in popularity of special effects and make-up effects-dominated genre films in the 1980s, such as the Star Wars and Indiana Jones franchises, audiences became fascinated with how this movie magic was achieved. 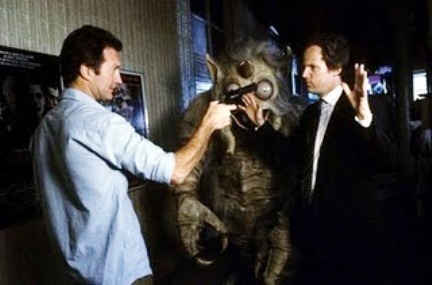 Magazines such as Cinefantastique, Fangoria and Starlog often featured interviews and profiles on the prominent figures that worked their magic behind-the-scenes, most notably Rick Baker, Rob Bottin and Tom Savini. So, it makes sense that a film about someone who worked in this profession would eventually be made during this decade. The film begins, appropriately enough, with a cleverly orchestrated illusion. A man enters a restaurant on a rainy night. He takes one look around and proceeds to riddle the place with machine gun fire, indiscriminately shooting people until he finds his intended target: a beautiful blonde-haired woman in a white dress. He viciously guns her down. Suddenly, everything stops and a man emerges to reveal that this has all been elaborately staged for a film. The man’s name is Roland “Rollie” Tyler (Bryan Brown) and he’s one of the best special effects artists in the movie business. His realistic-looking work catches the eye of a man claiming to be a movie producer. He meets with Tyler the next day and reveals that his name is Lipton (Cliff De Young) and he actually works for the Justice Department. He wants Tyler to fake an assassination of notorious mob informant Nicholas DeFranco (Jerry Orbach) who is going into the Witness Protection and Relocation program. Tyler is going to be given very little time to pull it off and at first he isn’t too keen about going out of his comfort zone — after all, he deals in make-believe. However, Lipton and his superior Col. Eddie Mason (Mason Adams) appeal to Tyler’s vanity and tell him that they’re thinking of going with one of his rivals instead. That does it. Well, that and the challenge of pulling off a staged assassination in public. However, Mason adds a further wrinkle to the job. In addition to doing all of the make-up effects, Tyler also is going to be the trigger man and paid $30,000 for his troubles. He has a bad feeling about the job but decides to do it anyway. The night of the staged hit is a repeat of the film’s opening sequence, which gives the scene an atmospheric neo-noir vibe. The fake assassination goes off without a hitch except that in the getaway car Lipton tries to kill Tyler (“No loose ends,” he tells Tyler). The special effects man narrowly escapes by forcing the car to crash. Tyler calls Mason and tells him about what happened, to which the lawman reassures him and says that he’s going to send two men to pick him up. Tyler is almost killed again and realizes that he can’t trust his employers anymore. He takes refuge at his girlfriend’s apartment. Ellen (Diane Venora) is an actress who has appeared in some of his films. Pretty soon Tyler is on the run, using his skills as a special effects artist to get revenge. DeFranco’s murder is investigated by the police and this is where Lt. Leo McCarthy (Brian Dennehy) enters the picture. He busted DeFranco but never got the credit because his abrasive personality and his methods pissed people off in the police department. He wants in on the case and has a hunch that Tyler’s has something to do with the DeFranco shooting. 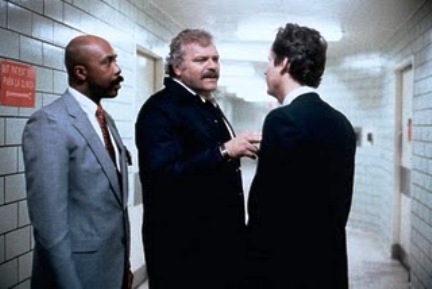 In the 1980s, it seemed as if Brian Dennehy and Nick Nolte had a running competition on who could play more rumpled, burnt out cops that were loose cannons (although, I think that Nolte comes out on top). McCarthy’s introduction is even similar to that of Nolte’s in 48 Hrs. (1982): he’s awakened by a phone call from his partner Mickey (well-played by veteran character actor Joe Grifasi) and is a grumpy mess. Despite his appearance, McCarthy is a smart cop and pretty soon he begins to suspect a set-up, especially after talking with Lipton and Mason. He’s got a hunch, the quintessential gut instinct that all good movie cops get. Brian Dennehy has a lot of fun playing McCarthy with his own distinctive rumpled charm and sly wit, albeit with fierce convictions. For example, the scenes where he deals with a woman in the department who gets him information from a computer are fun and also provide more clues to the conspiracy that is unfolding. It also shows McCarthy doing real detective work as he begins to piece together the mystery. Dennehy certainly has an imposing presence — he’s a big, burly man but he also conveys an intelligence that those around him (especially his superiors) underestimate. He takes what could have been a stock stereotype and transforms it into something special and it’s a delight just to watch Dennehy do his thing whenever he’s on-screen. Australian actor Bryan Brown does a good job as the innocent man who is set up and fights to clear his name. Initially, he portrays Tyler with just the right mix of prankster and a slight whiff of arrogance. The guy knows that’s he’s one of the best in his profession but as he becomes embroiled in this conspiracy he develops some humility. The film spends some time getting to know Tyler so that when he gets set up for murder we empathize with his plight. F/X was Brown’s calling card to Hollywood and he dabbled in a few high-profile gigs (Cocktail anyone?) before settling into respectable character actor roles and doing several films back in his native country, including, most recently, an appearance in Baz Luhrmann’s lavish epic Australia (2008). Cliff De Young is quite good as the slightly abrasive and corrupt Lipton. He turns on the charm early on as he gains Tyler’s confidence and then embodies bureaucratic nastiness once Tyler has outlived his usefulness. Attentive viewers should spot Tom Noonan (Manhunter) in a small role as one of Mason’s henchmen. Plus, you get to see a pre-Law & Order Jerry Orbach play a bad guy. He has a nice bit where his character tells a bunch of Mason’s goons to do something and they ignore him until Mason tells them to do it. DeFranco still thinks he can order people around but he’s been reduced to an observer. Director Robert Mandel does a nice job of showing off New York City as Tyler is chased all over town, which gives a real sense of place. It is refreshing to see actual city locations used instead of being doubled with Toronto (as would happen with the inferior sequel). He does a fine job of plugging the various thriller components into the film (the car chase, the fight sequence, the gun battle), demonstrating that he must’ve been taking good notes while watching films like The French Connection (1971). There is a refreshing messiness to many of the action sequences, such as when Tyler escapes Lipton’s attempt to kill him, and even more so when an assassin tries to kill Tyler in his Ellen’s apartment. Tyler is not a trained combatant and has to literally fight desperately for his life, using whatever is within reach – a kettle, a toaster, an iron — to defeat his opponent. This roughness gives the sequence an unpredictable intensity that you might not have gotten from a more experienced action film director. The origins of F/X lie in an unsolicited screenplay written by two novice writers, actor Gregory Fleeman and documentary filmmaker Robert T. Megginson. Producer Jack Wiener read their script, which they had submitted as a low-budget television movie, and felt that it should be made into a theatrical feature. Wiener and his co-producer Dodi Fayed hired Robert Mandel to direct. They did not want an action director because they were looking for someone that would bring a realistic touch and make the audience care about the main character. This project was a departure for Mandel who got his start in theater, directing off-Broadway productions of Chekhov and Shakespeare. He eventually graduated to feature films with Independence Day (1983) and Touch and Go (1986), character-driven productions that were not commercial hits. With F/X, the director wanted to dispel the perception that he was a “soft, arty director.” Initially, Mandel was not impressed with the film’s script which he felt was not well-crafted but understood that it provided for “a lot of action and a lot of things I did not have under my belt.” He did his homework by studying chase scenes from Bullitt (1968), The French Connection and E.T. (1982) in preparation for the one in F/X. A preview screening in the San Fernando Valley produced some of the best statistics Orion Pictures, which financed and distributed F/X, had seen in some time. A week before its release, a film industry screening went very well as did its premiere at the United States Film Festival (later known as the Sundance Film Festival). The film did well at the box office, grossing more than $20 million in North America (well above its $10 million budget), but executives at Orion felt that it could have performed even better with a different title. One executive claimed that no one understood what the title meant and accepted it because that was what the producers wanted. Wiener admitted that they thought the two letters together would be "provocative" like MASH (1970) and admitted they had made a mistake. F/X was well-received by film critics. Roger Ebert gave the film three-and-a-half stars out of four and wrote, "This movie takes a lot of delight in being more psychologically complex than it has to be. It contains fights and shootouts and big chase scenes, but they're all firmly centered on who the characters are and what they mean to one another.” In his review for The New York Times, Vincent Canby praised the look of the film, writing, "although the movie, which looks as if it had been made on an A-picture budget, has a lot of the zest one associates with special-effects-filled B-pictures.” The Globe and Mail’s Jay Scott wrote, “F/X is simply out to give a good time, which it does superbly.” In his review for the Washington Post, Paul Attanasio praised Brian Dennehy's performance: "Dennehy brings magic to the role — he's large, and he enlarges it. With his sly eyes and little can opener of a nose, his shoulders a yard wide, his hair massing in gray curls behind his ears, he dances through the movie like a mastodon in toe shoes." The success of F/X paved the way for a sequel in 1991 and a spin-off television series that ran from 1996 to 1998, but neither is as good as the original which still holds up as a smart, engaging thriller for adults with a wonderful performance by Dennehy and excellent use of New York locations. Even the clichéd elements are well done. It’s a thriller that actually spends time developing its characters so that we are invested in what happens to them. F/X is an enjoyable ride, one that is much better than you would expect. It is the cinematic equivalent of an engrossing page-turner, the kind of film that Hollywood used to be good at making but is now a rare species in this age of lackluster remakes and lame sequels. I remember having little interest in this until I saw Siskel and Ebert's review of it. It was a blast, especially Brian Dennehy. Yeah, Dennehy makes this film. Nobody can do rumpled cop like he can... 'cept maybe Nick Notle.